Cucumber plants may develop mold diseases, primarily as a result of poor environmental conditions. Two diseases in particular display white mold as symptoms; gardeners should be able to distinguish between the two diseases to provide proper disease management. Infections occur in the spring and summer months. 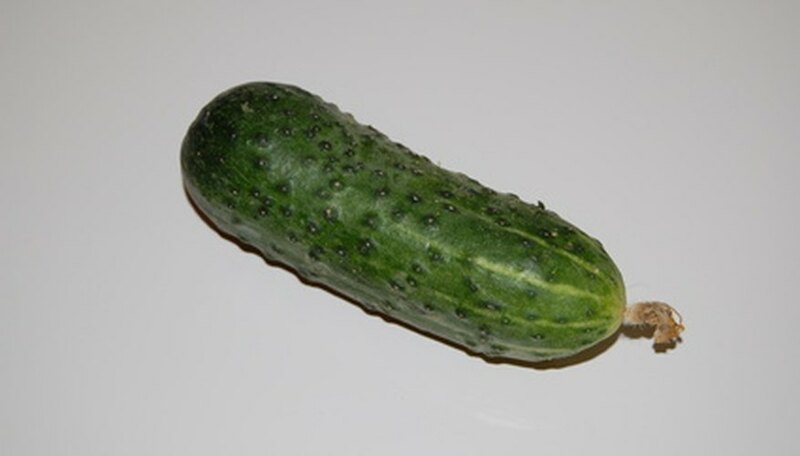 If left untreated, they can affect the cucumbers themselves. Cucumber plants can experience white mold disease and another disease, powdery mildew, that produces a white mold as part of its symptoms. All types of cucumbers can contract white mold or powdery mildew. These diseases can cripple backyard gardeners and commercial growers alike. Powdery mildew first causes plant leaves to break out in yellow splotches. As infections worsen, the leaves become coated in a fine white mildew or mold. White mold disease also displays white mold; this is more fluffy and appears under humid weather conditions only. Small black dots appear within the fluffy white mold; these are the hard resting bodies of the fungus that causes white mold. Stems of infected cucumber plants can rot; cucumbers can rot and turn watery. When cut open, infected fruit may contain the small black fungal bodies. True white mold displays no leaf symptoms. Powdery mildew occurs most often in wet or humid spring weather, when plants do not have sufficient air circulation, and the leaves remain damp or wet for long periods of time. White mold is caused by a soil borne fungus, Sclerotinia sclerotiorum. This fungus infects other cucurbits, tomatoes, lettuce and many other vegetables and garden plants. The fungus can survive in the soil for five years and may exist for a couple of years without showing symptoms. Cool, wet weather promotes the spread of white mold. White mold is a minor disease of cucumber plants, but it can ruin your crop. The fungus is extremely challenging to remove from the soil once it takes hold. As of 2010, no chemical control exists for white mold. Gardeners can control for powdery mildew by planting resistant types of cucumber and by treating infected crops with sulfur-based products. Prevent the occurrence of white mold or powdery mildew by giving plants enough water, but not too much, and by following proper cucumber plant spacing guidelines (which vary by variety). Only water cucumber plants when the soil becomes dry and crumbly to the touch. If your garden gets infected with white mold, plant resistant crops (like corn) in that spot for five years until all traces of the mold are gone.